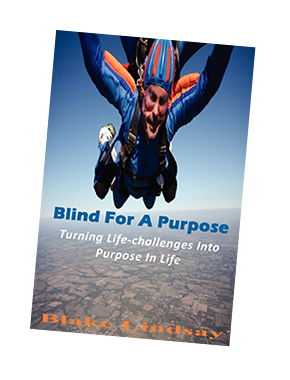 CHECK OUT BLAKE’S INSPIRATIONAL AUTOBIOGRAPHY BLIND FOR A PURPOSE TODAY! If you're looking for inspiration from a gifted speaker who can motivate, encourage, and invigorate—someone your audience will appreciate and talk about for a long time—look no further. Dallas motivational speaker Blake Lindsay knows how to educate, delight, and inspire your group with an unforgettable message about recognizing opportunities, overcoming obstacles, and seeing the world with new vision. — Tom Ziglar, President & CEO, Ziglar Corp.
SEE WHAT PEOPLE ARE SAYING ABOUT BLAKE! Blind since infancy, Blake sees his blindness as a gift to share with those who can see with their eyes, but who too often limit themselves by self-imposed and often crippling barriers. Through his personal stories of triumph over impediments, determination over fear, resilience over shortcomings, Blake will leave your audience equipped with new tools and restored clarity for turning life's challenges into purpose in life. The perfect keynote speaker for a conference kickoff, breakfast or luncheon address, or as a workshop speaker, Blake will leave your audience feeling energized, galvanized, and engaged. As a former associate of the late Zig Ziglar, Blake has been a favorite speaker for organizations ranging from Frito Lay to Texas Instruments to local Rotary Clubs and churches. Blake is the real deal. He has never been satisfied with merely taking life as it comes. A major market radio personality for 22 years, Blake also enjoyed a 7-year career in banking and is now Communications Director for the Dallas Lighthouse for the Blind and a Voice Artist. A person of faith, a husband, a businessman, an author, Blake is an adventurous spirit with an amazing gift—his heart. Please consider inviting Blake Lindsay to bring his uplifting message to your upcoming event. Your audience WILL leave feeling more aware, accountable, and empowered by Blake Lindsay! I grew up in Westfield, Indiana, where I attended the Indiana School for the Blind from kindergarten through tenth grade. I never believed that being blind was a handicap. To me, blindness was a gift. In high school, I took broadcasting classes and fell in love with the profession. That experience prepared me to become a radio personality and later on an author and public speaker. I now live in Plano, TX, with my wife Jennifer. When I'm not recording in my home studio, I'm usually out giving inspirational speeches or promoting an organization very near and dear to my heart—the Dallas Lighthouse for the Blind.